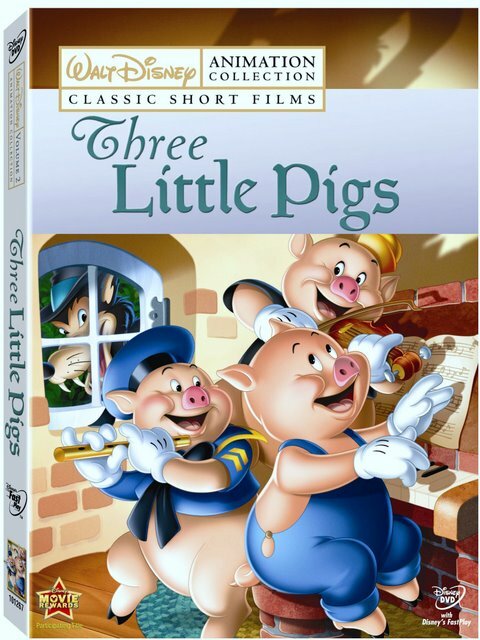 A few of the most recurring complaints surrounding Walt Disney's brand new collection of some of their most beloved, famous, and award-winning short films is that the titles have already been released numerous times and the picture and/or sound doesn't appear to have been remastered or adjusted for these discounted films. And while admittedly, I did notice the extra background noise and dulled colors found in my personal favorite Wind in the Willows, I found this second volume release of Three Little Pigs extremely impressive. However, its technical superiority is most likely due to a few changes with the short. Most recently it was selected for preservation in the the United States National Film Registry collection at the Library of Congress which deemed it a national treasure in 2007. Likewise, in addition to the polish of the film's transfer, we're presented with a historically inaccurate version of the 1933 Oscar winner since--and much to the relief of viewers today-- the previously Anti-Semitic characterization of The Big Bad Wolf as a "Jewish Peddler" has been removed. A wise and responsible decision that the studio made more than a few decades ago, even going so far as Ultimate Disney revealed to change it for the short's inclusion in the Walt Disney Treasures limited edition collection-- the short is all the better for it in just getting viewers caught up in the classic and catchy "Silly Symphonies" version of the famous fable. Throughout, it offers a great finger snapping and toe-tapping usage of "Who's Afraid of the Big Bad Wolf?" that plays throughout the short, two of its sequels included on the disc in Big Bad Wolf and Three Little Wolves (despite ditching its final installment with the absence of the third sequel The Practical Pig) and indeed during the DVD menu. And in the title short, we're instantly delighted by the tale of the three cute pigs who build their respective house of straw, sticks, and bricks to try and keep the wolf at bay. Typical for the "Silly Symphonies" releases, the marriage of movement and music is beautiful and consistently in sync and you'll be amazed when you watch it today and realize just how much of an impact perhaps even subconcisously Three Little Pigs had on popular culture in not just the amount of renditions of that famous song (which you'll no doubt find you're still humming the next day) but also in various "defeat the bad guy" plots a la Home Alone. The sequels that follow the original don't live up to the Oscar winner (or at least, this more politically correct version) but the first one is extremely amusing as the pigs find themselves intervening in Little Red Riding Hood's near-death experience with the wolf as well as she skips along with her picnic basket to visit her sick grandmother. Likewise-- managing to somehow work in Goldilocks and/or what appears to be Little Bo Peep-- this time around and despite the fact that it's called The Big Bad Wolf, the pigs start to develop a bit more personality as we encounter Practical Pig ready and willing to do battle when necessary. Having gotten even more practical than before-- sure enough, he hastily loads a bunch of anti-wolf weapons in a medical bag before saving the day once again. In fact, we only grow fonder of him in the next fascinating but admittedly strange short as the Big Bad Wolf suddenly morphs into what we're assuming is a Nazi when he lectures to his Three Little Wolves in German. While definitely trendy and fitting into the era of films that made German characters evil in World War II-- for anyone of German descent, it still manages to sting and although it's far less offensive than the descriptions I read about the original Wolf in '33, it's definitely a product of its time and prejudice. Still, when you don't read that much into it, it's a fun diversion to see as once again Practical Pig-- having moved way beyond simply building a house with bricks-- has designed a Wolf Pacifier a.k.a. a wicked gauntlet to teach him a lesson one more time. Heavily borrowing from The Boy Who Cried Wolf as the pigs have developed a wolf alarm they're told to sound for emergencies only but of course, we find the other two have fun at the expense of Practical Pig by constant tricking him into "attack mode" when it isn't necessary. Filling the rest of the DVD (that also comes complete with a collectible Litho Print still from the titular short) with other animated animal themed works like Lambert The Sheepish Lion, Chicken Little, Three Blind Mouseketeers, and Elemer Elephant-- while again to the chagrin of Disney die-hards it's missing any background information or extras, it's still a great (and relatively inexpensive) way to collect some of the studio's influential, groundbreaking, and irresistible shorts without having to go back and locate more complete out-of-print compilations that come with a far heftier price tag. So this time, ultimately I can say with confidence that there's absolutely no reason to be "afraid of the Big Bad Wolf" as far as this disc is concerned.